We are all familiar with the classroom blackboard. Chalk and talk was a learning technique employed in schools throughout the UK in the 20th century. Today in primary schools, however, teachers appropriate the walls in their classrooms, the corridors and school halls as mechanisms for learning, in many ways, particularly at key stages 1 and 2 (5 to 11 years). Teachers use such walls as, working walls, learning walls, teaching walls, smart boards, interactive whiteboards and of course for wall art. What are these 21st century vertical audio-visual aids that facilitate effective learning? What is a Working Wall? It is the public display of the learning process and evolves as each day progresses. It is not static. It can increase effective learning and teaching. The purpose of the working wall is to support children's independent writing. It evolves as a unit of work unfolds, and is not intended to be a tidy display of finished work. Well, planned working walls can: Support independent working and learning: think of the Working Wall as an extra adult in the classroom. What is a Learning Wall? The learning wall is similar to a working wall, but is more focused and target led, within a particular facet of the curriculum. They are mostly used in a primary school for reading, writing and maths. Teachers use them to model and share children's thinking processes. Children use them as a prompt for their thinking. Most schools now have interactive whiteboards (IWBs) in every classroom. Interactive whiteboards are the size of a usual class whiteboard but are connected to a teacher's computer, which means that whatever the teacher is doing on the computer will appear on the interactive whiteboard. The teacher has an IWB pen which they use on the IWB, which is either put into 'pen mode' for writing and drawing or 'cursor mode' for clicking on items on the screen, just as you would do on a computer. Special software is provided for interactive whiteboards which offer a range of mathematical drawings and equipment, pictures and paint tools. Wall art can be merely decorative. It can make the classroom brighter and a more interesting and stimulating place. This can have a direct impact on pupil motivation and consequently on pupil learning. It can be used to set the scene for a new teaching topic. The teacher can put some stimulating material on display to promote pupil interest in a topic that is going to be taught. Art is important because it encompasses all the developmental domains in a child development. Art lends itself to physical development and the enhancement of fine and gross motor skills e.g. when kids work with play dough, they fine-tune their muscle control in their fingers. It is an obvious thing to say but children need to express themselves to engage in educational processes and learning. There are also commercial companies who create bespoke wall art for schools. They can communicate everything that’s positive about the school to everyone connected with it, creating an inspiring environment in which to work and learn. They claim that they can create areas that communicate values and visions, compliment the curriculum or simply raise a smile from everyone who sees them. Wall art is also valued by adults who want personalised wall art in their homes, to express themselves. In fact, one could say…your walls are your blank canvas. There is a year on year growing trend to display wall art in the home. Metal wall art is the No. 1 best seller at Brilliant Wall Art. All our metal wall art items are carefully crafted from metal and easy for you to wall mount. Perhaps you know someone who loves metal wall art decor, with various designs across our site making an ideal gift for any occasion. With metal wall art flowers, fish, sailing yachts, lizards and much more to choose from, you will be spoilt for choice. It’s now Autumn and all the children are back at school. 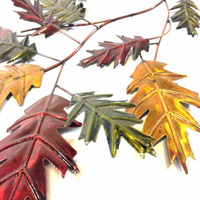 Autumn Metal wall art is in vogue. Take a peek at our Autumn tree art products too.